The Jeanne Jugan Residence offers a friendly, family-oriented work environment. As Little Sisters we believe in the principle of equal opportunity for all. Our employees embrace our mission of caring for the elderly poor. It is their goal to ensure that all of the Residents receive the care and dignity they deserve in the spirit of our foundress Saint Jeanne Jugan. 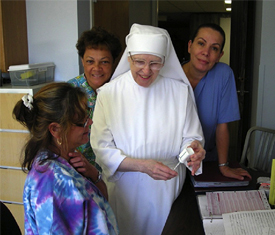 If you are interested in employment or would like to send a resume, please email to pwhumanresources@littlesistersofthepoor.org. Your resume will be given careful consideration and you will be contacted should a position become available for which you are qualified.